I will be doing two different presentations on horse color at BreyerFest in Lexington, Kentucky next week. The first one, “Horse Color – Tips for Model Horse Artists, Showers and Judges” is scheduled for Friday, July 15 at 1pm and will cover the basics of horse color. This is an updated version of the talk I first gave with Dr. Sponenberg. It has been ten years since that original presentation, so there is a lot of updated information. I have also included a section on appaloosa patterns, which were not covered that first time around. The talk is geared towards those with very little background in horse color and is not highly technical in tone. It could be subtitled Horse Color is not Rocket Science. The second presentation, “The Mythology of Color”, is scheduled for Saturday, July 16 at 2:30. 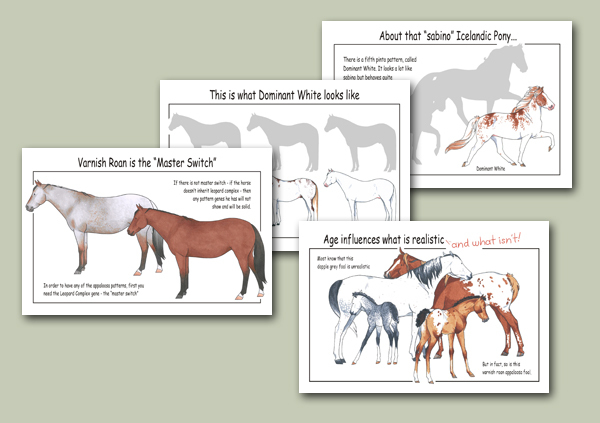 It is a completely different presentation from the first, and covers some of the history of the different breeds and how that relates to color. It is even less technical than the first presentation, and covers some related topics like breed mythology, registry regulations and changing fashions. It could be subtitled Scandalous Things Not Generally Known about Breeds and Their Colors. It is the presentation that was recently given in San Diego, and ties in pretty closely with the material in the upcoming book. Both presentations will be in the Visitor’s Center Theater at the Kentucky Horse Park. It has been a few years since I presented there, and I am looking forward to sharing some of the new information with everyone. I am also excited because one of the guest horses, Sato, is a patterned son of the dominant white stallion Puchilingui. That is the fifth of the known dominant white families (W5), and one that seems particularly prone to a more broken, spotted expression than some of the others. I am really looking forward to seeing him, along with the Ky Colonel (W2) descendant White Prince. I will be hoping for good picture-taking weather! 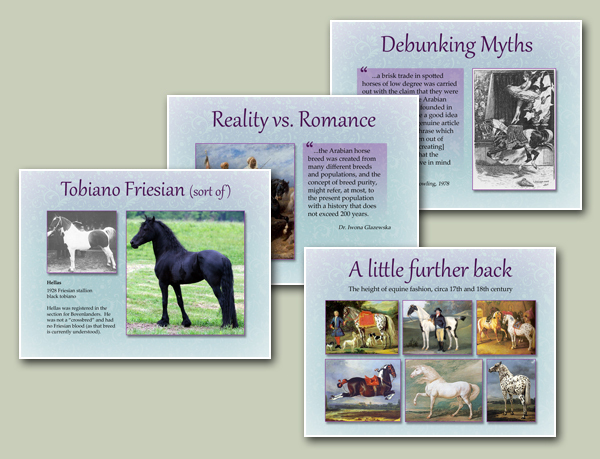 I will be doing a presentation on horse breed mythology and the history of horse color at the BOYC Convention on Saturday, May 21. Hopefully I won’t scandalize too many people when I talk about tobiano Friesians. As part of this, I completely restructured and updated the old “What is Possible?” charts. I also updated a second set of charts dealing with less common breeds that were never published. After I return from the convention, I will post both to the studio website. The new charts include some of the more recent dilution genes (like pearl and mushroom), and break appaloosa patterning down by its component parts, since not all breeds have all the components. The charts still don’t cover all the breeds or even all the known color oddities, but they are much closer to it than they were.